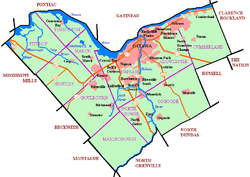 Carp is a compact rural community in West Carleton-March Ward in the City of Ottawa, Ontario, Canada, located in the northwestern portion of the municipality on the Carp River. It is about 33 km (21 mi) from downtown Ottawa. Prior to amalgamation in 2001, Carp was located in the West Carleton Township. Carp is located in the Carleton—Mississippi Mills electoral riding. By 1866, Carp was a post village with a population of 200 of the Township of Huntley on the Carp river, 32 km (20 mi) from Ottawa. The village contained three stores, workshops, three hotels, and a town hall. The Loyal Orange Lodge, No. 439, met at the Orange Hall Carp on the first Wednesday in each month. Citizens included J. W. Featherston, general merchant and postmaster. Carp's main attraction is the Diefenbunker, Canada's Cold War museum just north of the village, and was featured in the film The Sum of All Fears. This former top-secret underground bunker was built to house key members of the government in the event of a nuclear attack on Ottawa. In 1960, NATO and the Canadian Department of National Defence built a satellite communications (SATCOM) station which supports a 68 ft (21 m) diameter metal space frame radar dome (radome) on its roof, which provides environmental protection for the 50 ft (15 m) diameter SATCOM antenna it houses. Until 1999 when NATO and DND decommissioned the site, the antenna provided satellite communications between all NATO countries. In 1999, it was purchased by Canadian Space Services Ltd. to serve as its corporate headquarters. The Carleton Masonic Lodge #465, a turn of the century (1900s) church building has been the Masonic Lodge in the Village of Carp since 1925. The building features original stained glass windows and is decorated with beautiful oak furniture that was originally located in a World War I Military Masonic Lodge in France. The original Masonic lodge building, which dates to 1904 was destroyed by fire in 1920. Carp was the site of an alleged 1989 UFO landing. It has been called "One of the most significant cases in UFO history." Someone dubbed 'Guardian' filmed the entire UFO crash. The American TV show Unsolved Mysteries filmed an episode on Guardian in 1993. There are three schools in the Carp area: Huntley Centennial Public School, St. Michael's (Corkery), and Venta, a private school which abruptly closed in late 2017 after the death of its founder. The Carp Airport is just south of the village. Carp also has a junior ice hockey team called the West Carleton Inferno. With the closure of Ottawa SuperEX in 2011, the Carp Fair is the only fall fair close to Ottawa and established in 1863. The Carp Exhibit Hall, one of the few remaining octagonal frame fairground buildings in Ontario, continues to function as the main fairground hall for the Carp Fair held in September each year since 1880. During the remainder of the year, the buildings and grounds serve the popular Carp Farmers' Market held each Saturday from May to October. The red-painted Exhibit Hall with white trim, which remains a focal point in Carp was included amongst other architecturally interesting and historically significant buildings in Doors Open Ottawa, held June 2 and 3, 2012. This Carp River got its name due to the overwhelming amount of the carp fish that lived within it. In the early 19th century, the river was overrun with the fish because farmers used to throw all of their dead animals in it. Conversely, in "Carleton Saga" by Harry and Olive Walker, the over-abundant fish is said by early French explorers to be suckers and mud-pout, that in French translate as carpe. ^ "YouTube". Archived from the original on 2016-04-19. Retrieved 2016-11-27. Wikimedia Commons has media related to Carp, Ontario. Wikivoyage has a travel guide for Carp. This page was last edited on 12 April 2019, at 06:04 (UTC).